If you write every day, or paint, or sculpt, you have to slow down and see the minutia of life to draw inspiration. If you blog five days a week, you look for the thing that will spark a story in your mind. Here’s my spark for today. 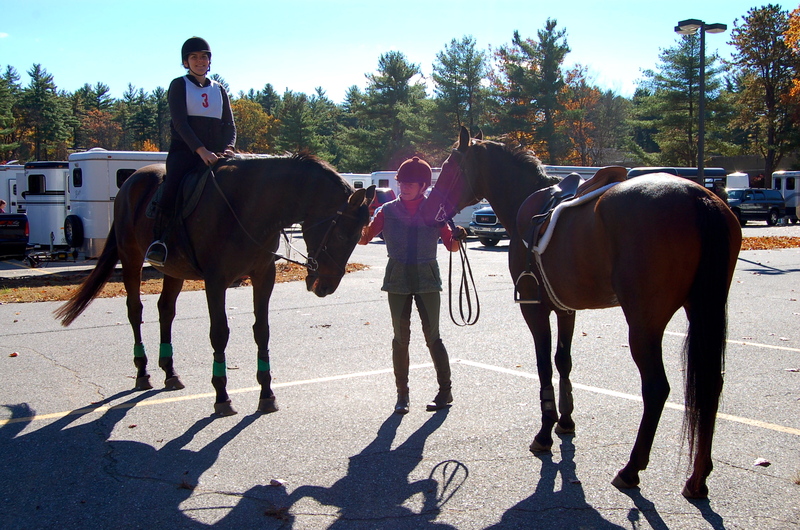 I spent Sunday morning at the Nashoba Valley Hunt Pace Ride. For those non-horsey followers, a pace is an event, hosted by a fox hunt club usually, that is a timed trek through the glorious Autumn woods. No one knows the optimum time, you are supposed to be simulating riding to hounds. There is a check or “hold hard” in hunting terms, about half way through the race. Back in the days of the farm, we hunted every year with Nashoba as a family. Their website still boasts wonderful pictures of a very young Lex and Hanni, hugging puppies and riding their ponies. As part of the hunt, we also worked the pace events, setting up the course, sitting at the check point to hand out cider to riders and time their wait. Though the course is cleverly changed every time, it covers the same piece of property in Pepperell, MA. At one time Shepley Hills was an olympic equestrian event course. Now it affords the less powerful riders a view into nature with great trails and jumps. I met my partner, Brit at the barn at 7am. She had already fed our horses so it didn’t take us long to pack the borrowed trailer and head out. While we were packing, the sun crested the last of the leaves, glowing golden and bright. We were one of the first to arrive, team number three to head out. The course is 8 to 10 miles and includes 44 jumps of all shapes and sizes. Small piles of brush and logs abound, as well as some other tricky obstacles. We didn’t jump them all, knowing there was so many, we could pick and choose. We also did not hurry. As the day warmed, our horses, Night and Miles began to sweat in their new velour hides. The nights have been cool and all the animals are building coats for winter. As we walked back along the river, Brit told me she likes to fantasize on trails like this. She pretends to be in Victorian England, when this was the only mode of transport and these were the “roads” folks traveled. One had to be watchful for highway men and robbers. My imagination joined hers in this child-like game as we wound through the sun-dabbled trees. It’s the little things. As we headed back to the trailer, we passed two older women just riding out. They were laughing and gave a huge thumbs up. “Someday I want that to be me,” quipped Brit. I smiled, knowing I was closer in age to them than to her. It’s the little things. We won’t know how we placed for a few days. The results are based on every team’s time and as we were returning teams number 40 and 41 were just headed out. What we did had nothing to do with winning and everything to do with taking time out of life with no phones, no cameras, no communication except directly with each other and our horses. This entry was posted in Wisdom. Tagged Equestrian, fall activities, Fox hunting, Nashoba Valley Hunt, riding. Previous Post Previous post: Lucky Girl! Glad you had such a good time. Wish I’d been there to help groom at least! Fun fall memories. Got my glass flower btw and it is gorgeous! Please tell them I got it because of your blog. Thanks, wish you were there too but you were there in spirit. Remember that rainy ride? I find it hard to believe that you EVER fall off unless the horse gets bitten by something….looks like fun. Oh Chris, I have eaten dust a few times, usually operator error! Sounds like a wonderful ride. You are so right, it is the little things!